We often think slavery is something that only happens in third world countries. But it happens in our country. “Surely that was two hundred years ago!” You might say. It is happening today; it is happening here. Human trafficking is a huge problem that we need to address. It is the second largest criminal trade in the USA right now, it comes in right under the illegal drug market. Roughly 15,000 people are trafficked in the USA alone every year. So what happens to these people when they escape or are liberated? Right now? Not much. These people, girls specifically, need a place where they can go that will keep them safe and will rehabilitate them. And that is exactly what Blazing Hope Ranch plans to offer. 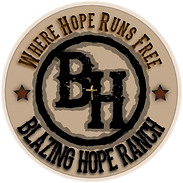 I spent this past weekend running a booth at the Southern Equine Expo for Blazing Hope Ranch to raise awareness and support for their mission. I was amazed by the response I got. This is something that is dearly needed and it was eye opening to see how many people agreed. I had several people nearly burst in to tears on me, and I realized that there were a lot of painful backstories involved that day. But people cared. Human trafficking is a horrible problem. But what I saw this weekend gives me hope for the future. I witnessed many people who are ready to stand up and fight this problem. My name is Karis! I am a freshman college student at Bryan College in Tennessee. Thanks for stopping by my blog! Have a question? Feel free to send me an email at karisatcollege@gmail.com. I'd love to hear from you! Karis at College on Spring Banquet! Beth P. on Spring Banquet!